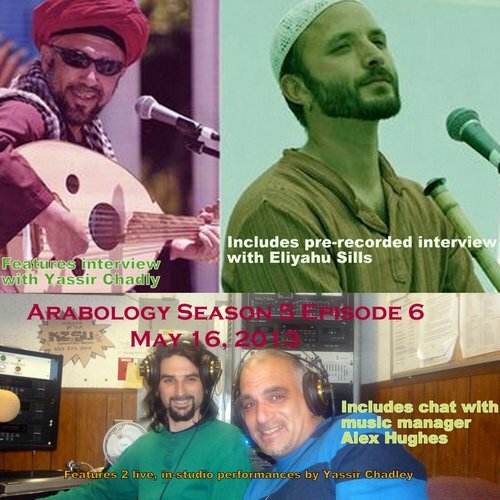 The May 16, 2013 episode of 'Arabology' features a pre-recorded interview with musician Eliyahu Sills and a live interview with Yassir Chadly who performs live on the show while playing the Oud and the gimbri. Also includes interview with music manager Alex Hughes who promotes 'A Night of Moroccan Gnawa, Sufi & Trance Music with Yassir Chadly, Eliyahu Sills, Tim Abdellah Fuson & Bouchaib Abdelhadi' on May 25 at La Pena Cultural Center in Berkeley. In addition to Gnawa, Sufi & Trance Music, this episode includes songs from the Arab Spring and tracks by Rami Essam, Autostrad, Tamer Abu Ghazaleh, Egyptian Project, Oumeima El Khalil, Jerusalem In My Heart, Jadal, Yaseen, La Tlateh, Hiba.